Let the fright fest begin, as Halloween Wars returns with a new season, a new special, and exciting new series, dishing out tricks and treats and frightful delights. The all-new special, Road to Halloween Wars, kicks off the seasonal celebration on Sunday, October 1st at 8pm ET/PT, as host Jonathan Bennett takes viewers behind the scenes of the journey leading up to the pumpkin carvers, cake and sugar artists that embark on the latest Halloween Wars competition. Year round, these gleefully ghoulish geniuses work to hone their craft, with dreams of Halloween Wars victory! 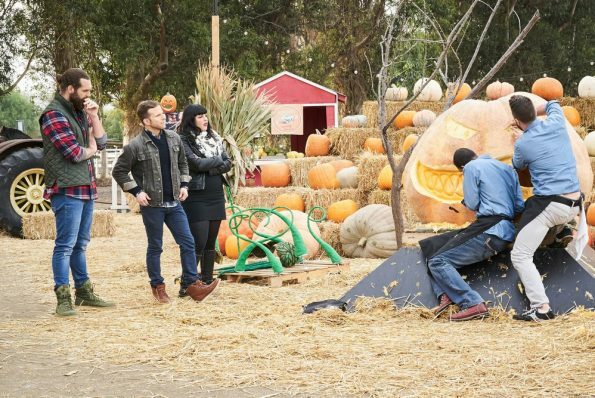 Then Halloween Warsreturns for a new season on Sunday, October 1st at 9pm ET/PT, when Jonathan Bennett challenges six teams to create amazing and frighteningly fun Halloween-themed edible displays. Over five episodes the teams must battle it out, as their creations are judged by renowned cake decorator Shinmin Li and horror film director and makeup effects master Todd Tucker, along with a rotating panel of celebrity guest judges, including Fiona Dourif (Child’s Play franchise), Bryan Fuller (Executive Producer, American Gods), Juliet Landau (Buffy the Vampire Slayer), Robert Patrick (Terminator 2: Judgment Day), and Shane West (The League of Extraordinary Gentlemen).One team will be eliminated each episode, with the last team standing walking away with the $50,000 grand prize. Halloween chills and thrills continue as new series Halloween Wars: Hayride of Horror takes the competition out of the kitchen and into the pumpkin patch. When night begins to fall and the pumpkin patch closes for the day, two teams of master food artists – working in cake, sugar, and a whole lot of carved pumpkin – face off to create terrifying Halloween displays through three episodes, with one team taking home $15,000 each episode. But to win the cash prize, the winning team’s displays of horror must win the votes (and screams) of a wagon full of hayriders and judges Zac Young and Bianca Appice. Hosted by Harley Morenstein, Halloween Wars: Hayride of Horror premieres Monday, October 2nd at 10pm ET/PT on Food Network. Premiering Sunday, October 1st at 9pm ET/PT – SEASON PREMIERE! Premiering Sunday, October 29th at 9pm ET/PT – SEASON FINALE! Premiering Monday, October 2nd at 10pm ET/PT – PREMIERE! FOOD NETWORK (www.foodnetwork.com) is a unique lifestyle network, website and magazine that connects viewers to the power and joy of food. The network strives to be viewers’ best friend in food and is committed to leading by teaching, inspiring, empowering and entertaining through its talent and expertise. Food Network is distributed to nearly 100 million U.S. households and draws over 46 million unique web users monthly. Since launching in 2009, Food Network Magazine’s rate base has grown 13 times and is the #2 best-selling monthly magazine on the newsstand, with 13.9 million readers. Headquartered in New York, Food Network has a growing international presence with programming in more than 150 countries, including 24-hour networks in the United Kingdom, Asia, and the Europe, Middle East and Africa (EMEA) region. Scripps Networks Interactive (NASDAQ: SNI), which also owns and operates Cooking Channel (www.cookingchanneltv.com), HGTV (www.hgtv.com), DIY Network (www.diynetwork.com), Travel Channel (www.travelchannel.com) and Great American Country (www.gactv.com), is the manager and general partner.